I was gifted some ramekins for my birthday, so then I was able to make some individual sized bread puddings like how I always dreamed. I had some old hot dog buns from a camping trip I used, which surprisingly worked great, but you can use any bread product. The lemon zest complimented with the blueberries is what really makes it special. 1. Cut bread or left over buns into chunks. About 1-2 inches wide. And then set aside. 2. Add 2 eggs, 2 cups of almond milk, 1 tsp vanilla extract, 2 teaspoons lemon zest, 1 cup sugar, and mix. 3. 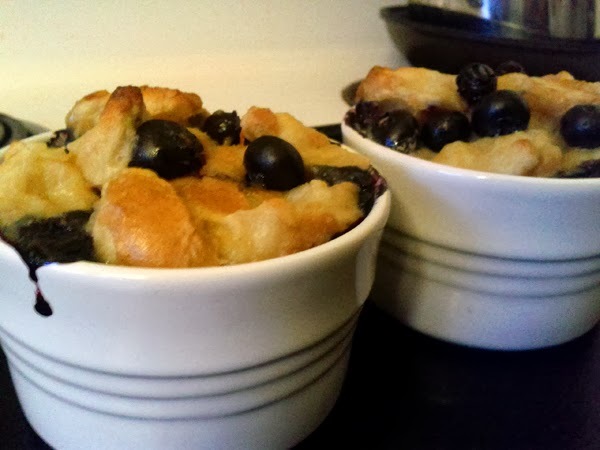 Fold in your blueberries, and your bread pieces until the bread is completely wet and is soaking up the mixture. Let the bread soak for 30 minutes. 4. Fill mixture into greased ramekins, and put in the oven at 350 F derees for 30 minutes, or until it feels firm in the centre.